The screening of the film Soldiers. Story from Ferentari at the cinema of the National Museum of the Romanian Peasant (MNTR) was interrupted on February 8 by several people, who disturbed the audience with noises and projected lights on the screen. The Police escorted them outside of the cinema hall and the screening was resumed. It was the second time in less than a week that a film shown at MNTR was interrupted. The screening of the French drama 120 BPM (120 Beats Per Minute) was interrupted on the evening of February 4. Soldiers. Story from Ferentari tells the story of 40-year old anthropologist Adi, who moves into the poor Bucharest neighborhood of Ferentari to work on a PhD thesis on the musical genre of manele. There he meets former convict Alberto, a Roma, with whom he starts a relationship. The protest had been announced on Facebook, and the screening of the film was not canceled, as the protesters would have wanted to. “By showing the film, they called us. 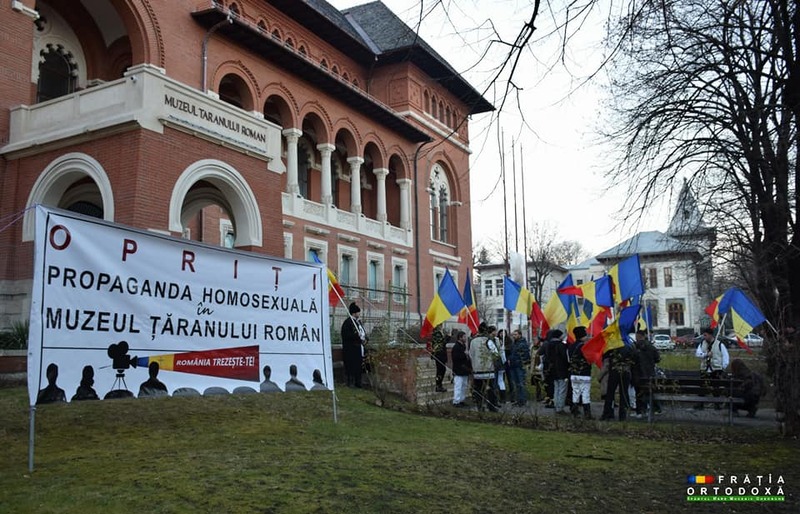 We have come to defend the Romanian peasant,” Dan Grăjdeanu, who led the protest, told News.ro. The protesters are part of the group called The Orthodox Brotherhood of the Great St. George (Fratia Ortodoxa Sf. Mare Mucenic Gheorghe Purtatorul de Biruinta). The group aims to “do good deeds.” “We, generally, on Fridays and Saturdays, go and help build a house, a church, cut wood for some care facility for the elderly, we go help when flooding happen. We try to enjoy beautiful moments with people with whom we share values and by doing something useful,” Grăjdeanu said. Referring to both 120 BPM and Soldiers. Story from Ferentari, the group said the films should be screened in malls. “We don’t have anything against homosexuals. They, if they want to do their thing, they can do it in their intimacy, nobody is chasing them, just as anyone does their thing in their secret. We have a problem with raising this deviation to the statute of virtue. The Romanian peasant had children by making love to his wife, but you are not going to see now pornographic films at the MNTR so people see how children were made. So, neither homosexual propaganda should be made,” he explained, quoted by News.ro. Ada Solomon, a producer of Soldiers. Story from Ferentari, said that any point of view should be expressed knowingly, and that it seemed “of the science fiction domain” to have a performance defended by the law enforcement agents. “To me, this is a false problem. First of all, things are judged without being in the know. To me, Soldiers. Story from Ferentary is a film that speaks about solitude, about the need for a home, a community, about poverty, and which, beyond all these, it is also a love story between two men. It is a love story that has nothing exhibitionist in it, nothing explicit. This film doesn’t have one kiss scene in the classical manner of an American film. So this is a false problem,” she said, quoted by News.ro.